I’ve been really excited to share this recipe with you! It turned out wonderfully beyond my expectations. Bell peppers, or “capsicum” as my Aussie mates call them, make a frequent appearance in my summer CSA share. The red, yellow, or orange variety I can live with – eating them raw as crudites with dip, adding to salads, steaming with other veggies & serving over rice with lemon cashew sauce, etc. I’ve got it covered. When the green ones arrive, I get a little disappointed. Not my favorite. This summer I’ve adjusted my attitude toward them, finding that when all else fails…stuff ‘em. Stuff ‘em with soy chorizo, roasted, corn & black beans. Stuff ‘em with quinoa & lentils. 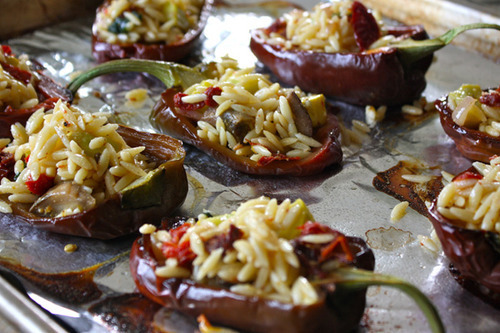 Stuff ‘em with rice, herbs, & sun-dried tomatoes. I’ve tried it all. 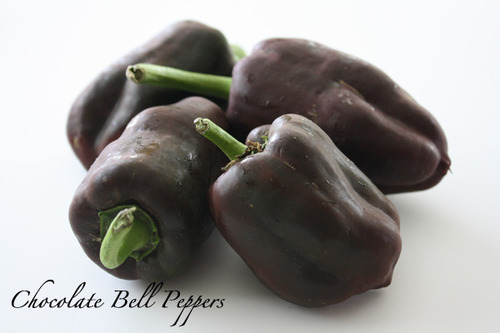 The chocolate, or sweet chocolate bell pepper is a unique type of bell, prized for its sweet flavor & chocolaty-brown color when mature. Excellent for salads, stuffing, or cooking. Excellent for stuffing! I can do that. So…what to stuff them with that I haven’t tried yet? I wanted to give these unique beauties a fresh recipe, not a standby. Then it struck me. 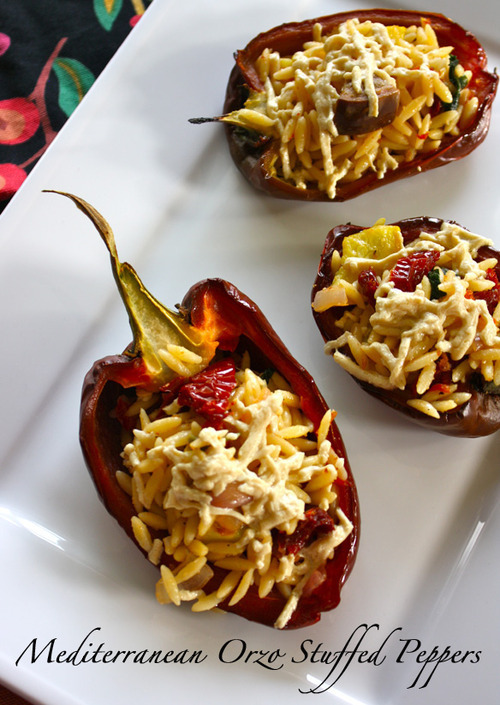 Stuff ‘em with…orzo!!! Hadn’t tried that yet. And a new idea is born. A little search around the trusty web lead me to a this recipe for inspiration. As luck would have it, I’d received two types of eggplant in my CSA share. For this recipe, I decided to use the rosa bianca, since I’d already had an idea for the Japanese eggplant. 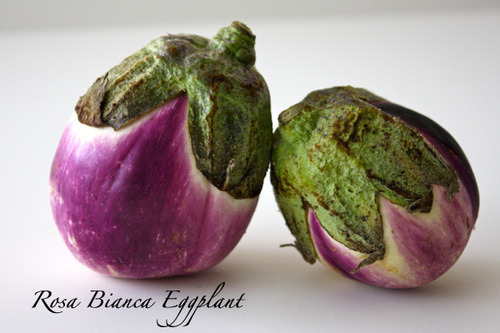 The Rosa Bianca Eggplant is a Sicilian variety with light pink-lavender fruits streaked with white and violet. Mild, creamy taste with no bitterness and very low number of seeds. Aren’t they lovely? I find them tender & mild enough that I don’t remove their skin when cooking. 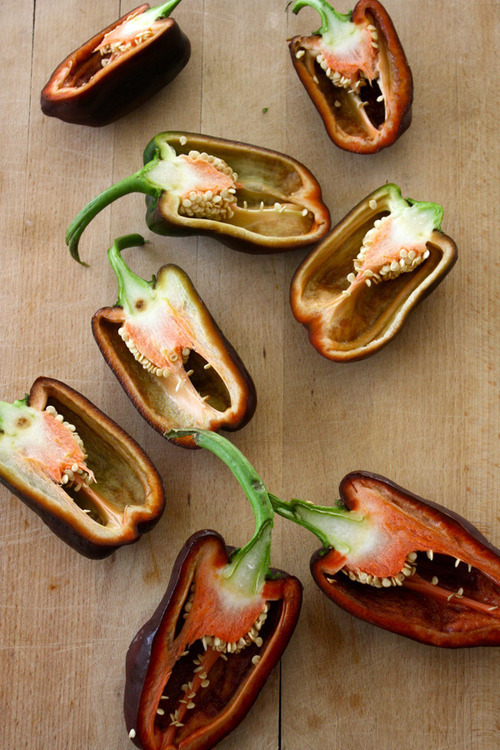 I think these might even be palatable enough for my Mom, who is not on team eggplant. With a plan set forth & my ducks in a row, it was time to start cooking. First step: roast the peppers. Typically when I stuff peppers, cut the tops & steam them before stuffing, helping to sweeten & soften them up a bit. But as the theme here was to try something new I challenged myself to do it differently. I halved the peppers down the center, leaving the stem in tact to give them an artisan appearance. I placed them cut side down on a foil lined baking sheet & roasted at 400 degrees F for 20 minutes. In the meantime, I boiled water for the orzo & sautéed the eggplant along with summer squash, garlic, & shallots. Then tossed the cooked orzo with the veggies, sun-dried tomatoes, evoo, Parmela (the best vegan Parmesan), & fresh basil. Here’s what I forgot: kalamata olives & pine nuts. They were part of the plan that didn’t make it to the final dish. Why? I was trying to beat the sun. Rushing to get this prepared so I could take photos before the light got any dimmer. Oopsies. 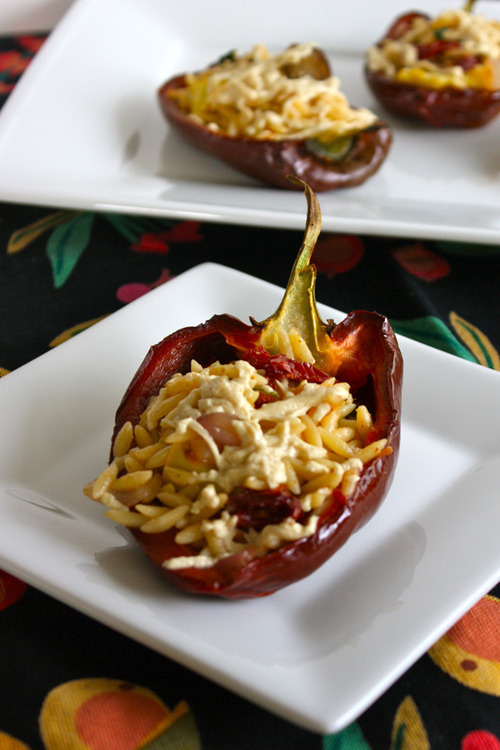 After preparing (& eating a few spoonfuls) of the orzo, it was time to stuff the roasted peppers & top with Daiya mozzarella & more Parmela, & put under the broiler for a few minutes to get the cheese good & gooey. You will have a lot of pasta left over, so you can serve it on the side, or save the leftovers for lunch. 6 medium sized chocolate bell peppers, halved lengthwise & seeded, leaving stem in tact. Heat oven to 400˚F. 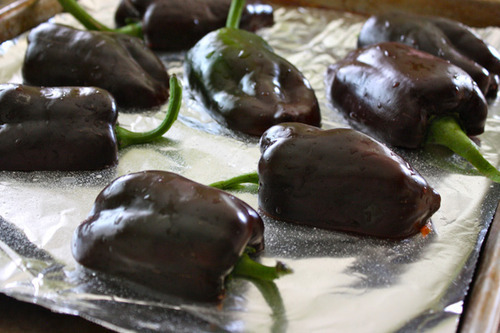 Place peppers on a greased baking sheet and roast at 400˚F for 20 minutes until tender. Prepare orzo according to package directions, drain, and place in a large bowl. Place 2 tablespoons olive oil, shallot, eggplant, & summer squash in 1arge nonstick skillet & sauté until veggies are tender, about 8 minutes, stirring frequently. Add garlic & sauté one additional minute. Mix cooked veggies, lemon juice, remaining 4 Tbsps. olive oil, sun dried tomatoes, basil, vegan Parmesan & salt in the large bowl with the orzo. Stuff orzo mixture evenly into roasted peppers. 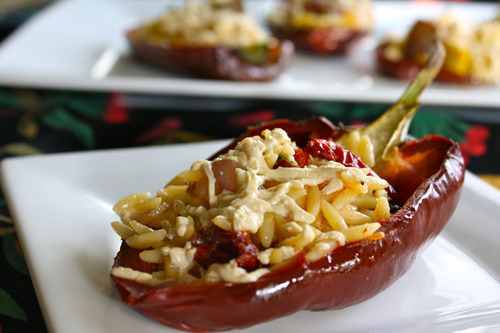 Sprinkle stuffed peppers with vegan mozzarella & vegan Parmesan. Place under the broiler for a few minutes to melt the cheese. Top with additional Parmesan, red pepper & fresh basil ribbons, if desired. 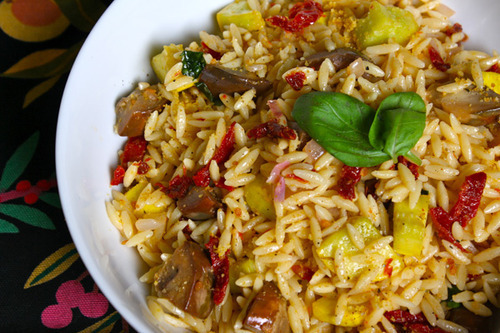 As I mentioned, I intended to add ½ cup chopped kalamata olives, & a ¼ cup of pine nuts to the orzo mixture to give this an even more “Mediterranean” flare. Please feel free to add these ingredients, or anything else that strikes your fancy, & let me know how it turns out. Except for my missing ingredient snafu, I was thrilled with how beautiful & tasty these turned out. 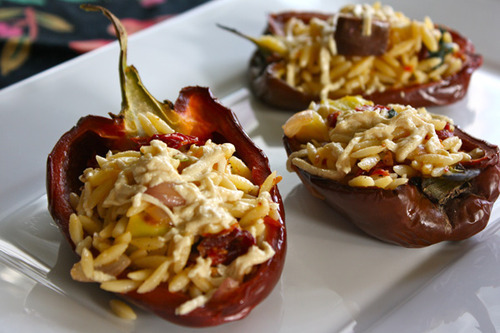 The Mediterranean flavors in the orzo worked wonderfully with the sweet roasted pepper. The addition of melted Daiya mozzarella added to the melt in your mouth goodness of the dish. I will certainly be making these again, with a little less rush, & a little more organization, next time.